Generate print and interactive forms using Adobe Document Services. Create print and interactive forms that look exactly like their paper counterparts. Capture data using forms and import the data directly into the SAP system. Embed other file formats inside PDF documents as attachments. Make connections from cloud and on-premise applications. Integrate with all existing SAP NetWeaver landscapes enabling a business application to establish and manage its individual form processing. Use a dedicated REST API to connect cloud applications. Some examples: Allow users to digitally sign PDF documents. Use bar codes out-of-the box. Convert PDF documents to the PDF/A format for archiving. Prefill interactive forms to save time and reduce errors. Simplify your IT landscape by replacing an existing local Java installation - saving you the cost of additional hardware resources. 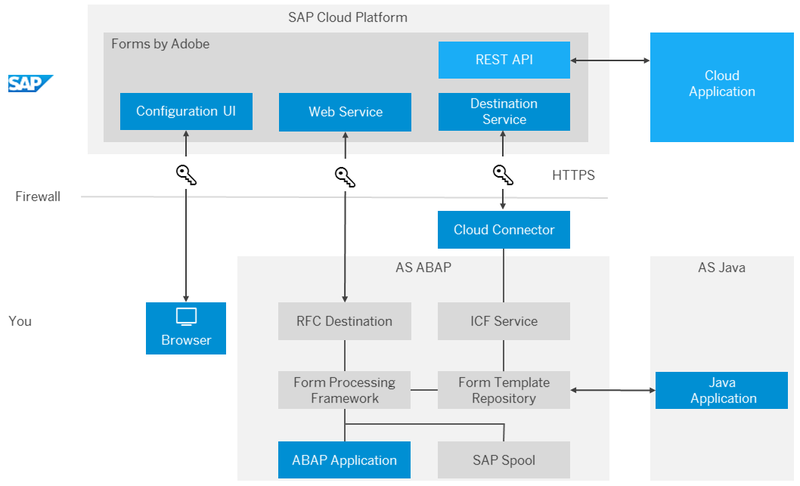 SAP Cloud Platform Forms by Adobe enables you to generate print and interactive forms using Adobe Document Services. You can call Forms by Adobe from a back-end system based on SAP NetWeaver using the Forms Processing Framework. You can also call Forms by Adobe from your applications using a REST API. In both use cases, the data and the form templates must be stored and referenced from within the back-end. The application sends the data and the form template using a secure connection, and the service returns the rendered document to the user.